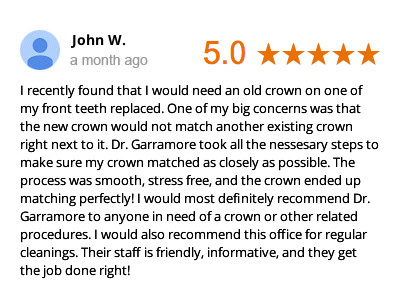 Dr. Peter Garramore provides a wide variety of dental treatments at All Smiles Dental. Whether you are seeking routine dental care, mini-dental implants, dental implant placement, or denture treatment, or you desire a more youthful smile, our Biddeford dentist will help you achieve your goal. At All Smiles Dental, your experience starts with a comprehensive exam followed by a detailed explanation of the dental findings and a complete treatment plan you can be happy with. Our dentist and dental team understand that in some situations, patients may have pressing dental issues at the first appointment. With this in mind, they will always make it a priority to address your painful problem as soon as possible. Established patients who develop a dental emergency are always given priority for emergency services. When you seek cosmetic dental services, Dr. Garramore will always look at your smile from an artist’s point of view. He understands that some patients’ teeth need a little more work to achieve the picture-perfect smile they have always dreamed of. For other patients, treatment options may be overwhelming, our doctor’s expertise and experience will guide you over time to the beautiful smile you want and deserve. 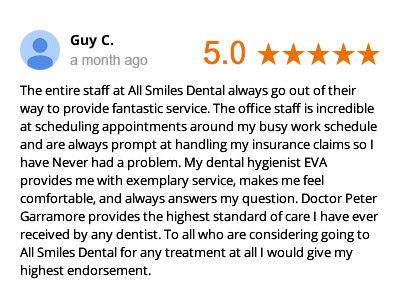 The entire dental team at All Smiles Dental understands the importance of five-star customer service and will do their best to make your dental experience a pleasant one. 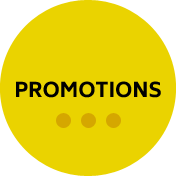 Whether you’re making an appointment, or have insurance questions or financial concerns, the entire team will be there to help guide you along to your ideal dental treatment. 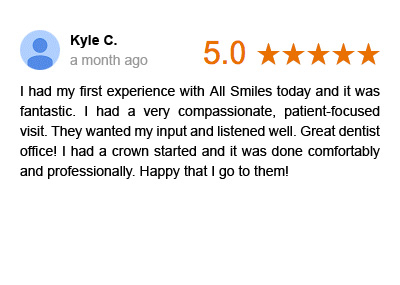 On behalf of Dr. Garramore and the entire staff at All Smiles dental, we welcome you to contact us and begin your dental journey. 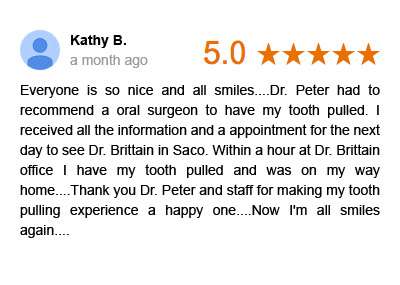 Contact our Biddeford dental office to schedule an appointment today!